Wondering if your long-lost friend, that crazy cooking girl from The Café Sucre Farine has disappeared off the face of the earth? I don’t blame you one bit. She hasn’t disappeared permanently, just has been in the midst of the whirlwind. Scott and I are relocating from Raleigh, where we’ve lived for the past 37 years, to the mountains of North Carolina, near Asheville. We are back and forth between the two homes until we close on the Raleigh house in mid-August. Our personal belongings (including kitchen equipment) is divided between the two places and, on top of that, the mountain house is still without internet. Consequently, there hasn’t been a lot of time and/or ability for cooking and blogging. 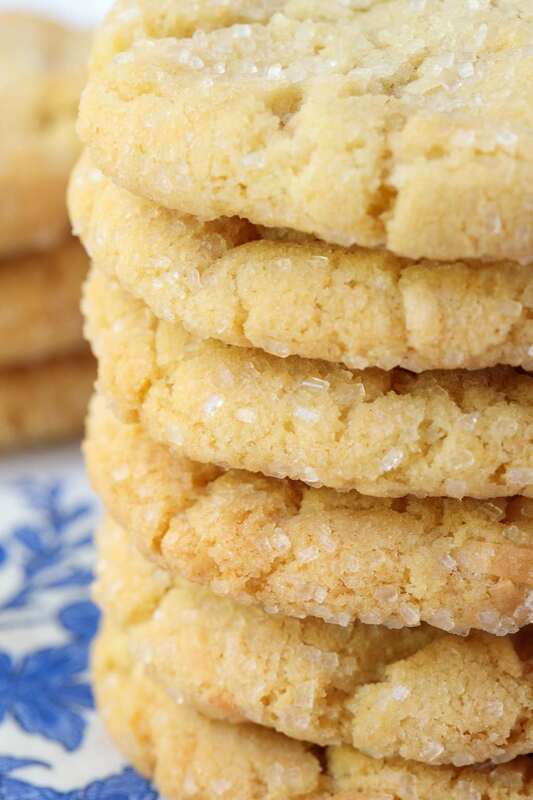 I did manage, however, to make several batches of these super easy, super delicious Lemon Coconut Sugar Cookies last week. And when everyone fell in love after the first bite, I knew I had to share this recipe with you! 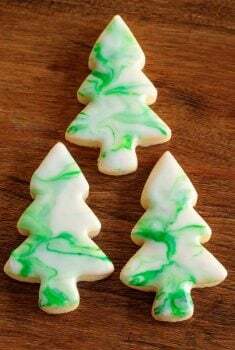 Let the kids loose with this easy cookie recipe! In addition to making 11 trips to Asheville (4 hours from Raleigh) in the past few months, we’ve also had the pleasure of spending sweet time with our children and grandchildren. A few of the grandkids spent last week with us, and I had a wonderful assistant with these Lemon Coconut Sugar Cookies, our second oldest granddaughter, Elle. Actually, in all fairness, I should probably call myself the assistant – Elle did most of the work in this baking endeavor. Either way, we had lots of fun together and she declared that these cookies were most “definitely blog-worthy” (the highest accolade possible at The Café kitchen). 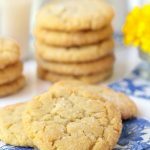 Unlike most cookie recipes, you want to start with cold butter for these Lemon Coconut Sugar Cookies. You will partially melt the butter in the microwave (or on the stovetop). This is what makes it a one-bowl, no-mixer recipe. The butter has to be slightly liquid, but not completely melted, to create the right consistency for scooping and baking. 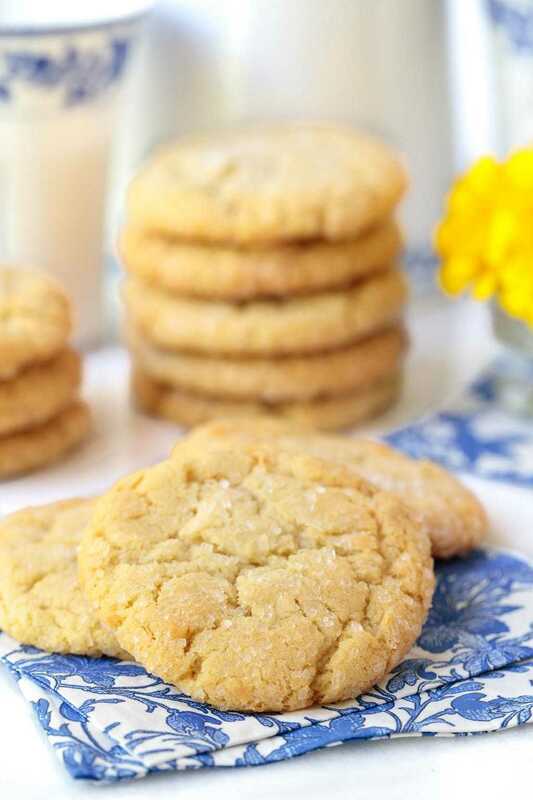 These Lemon Coconut Sugar Cookies include the finely grated zest from two lemons. I use my Microplane zester/grater for this. It’s a wonderful, inexpensive tool to have for zesting any kind of citrus; and it also works well for chocolate, garlic, ginger and more. Once the lemons are zested, go ahead and squeeze out all the juice. Zested citrus dries out quickly and you don’t want to waste that delicious juice. 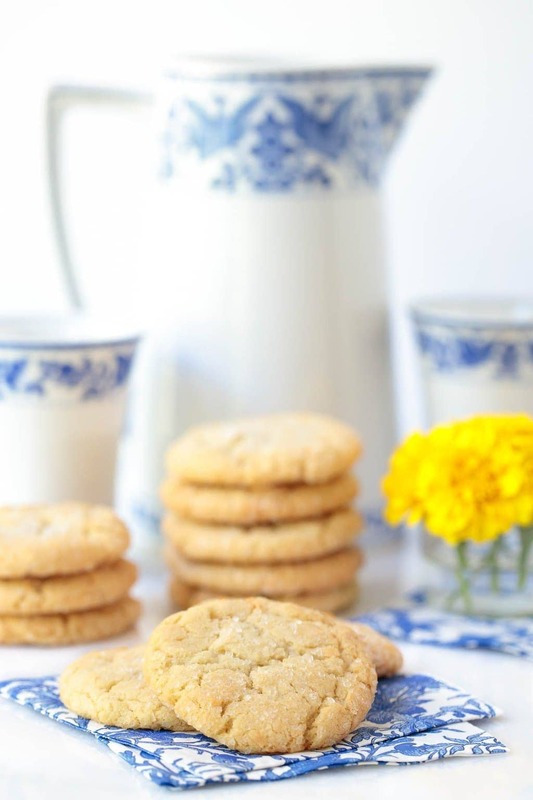 You’ll only need a tablespoon for the cookies, but lemon juice can be frozen for future use. If you like your cookies with crisp edges and chewy interiors, be careful to not overbake them. Remove them from the oven right when the edges are slightly golden (about 13-15 minutes). If you like your cookies crisp all the way through, bake them a few minutes longer. I like to use a cookie scoop for consistent size cookies. It makes scooping up the dough super quick and easy. I have a selection of different sized scoops so I can make small, medium or large cookies. The recipe calls for Demerara or Turbinado sugar to roll the balls of dough in before baking. These are both coarse sugars which give the cookies a little extra crunch. Feel free to use regular sugar if you don’t have or can’t find either of the coarser sugars. Demerara and Turbinado sugars can be found in most larger grocery stores in the same section as the granulated sugar. Preheat oven to 350˚F. Line two sheet pans with parchment paper for easy cleanup. Pour 1/2 cups Demerara or Turbinado sugar in a shallow bowl. You can also use regular granulated sugar. See Café Tips above. Place butter in a microwave-safe medium-large bowl and microwave on high power until partially melted, about 45 seconds. (see Café Tips above). Remove from microwave and add sugar. Stir until well blended then add egg, lemon zest, lemon juice, and vanilla. Stir again until egg is completely incorporated. Sprinkle baking soda, baking powder, salt, flour, and coconut over the top of the butter mixture and stir just until all of the flour is incorporated. Be sure to check the bottom of the bowl to make sure all flour is mixed in. Scoop up the dough (I use a cookie scoop) into roll 2 tablespoon balls and roll them in the Demerara or Turbinado sugar. Place sugared balls on the prepared baking sheet, spacing approximately 2 inches apart. Bake for 13-15 minutes or until just barely golden at the edges. Don't overbake. Allow to cool on the pan for 2-3 minutes then transfer to a wire rack to cool completely. See Café Tips (above in post) for further instructions and tips. I made these a few days ago. I wish I had made them sooner they are that good! It’s not often a recipe description is exactly what you get when you yourself make the recipe, but the description of crunchy edges and chewy centers is perfect, and the best kind of cookie. And without eating any of the dough, I got exactly 38 cookies with the cookie scoop. Amazing. Add in lemon and coconut . . . delicious! Here is the funny part: When I was mixing up the dough with my three-year old little boy helper, I wondered why the dough was so crumbly. I wondered how I was supposed to scoop it into dough balls to bake. I scrutinized the recipe again to see if I had misread the directions, and there it was, ONE cup of butter. That means TWO sticks, not one! So, wondering no more, I lightly microwaved the second stick and stirred it into my crumbly dough and it was much better, and scoopable! My helper rolled them in the sugar and plopped them on the tray. I love it when he asks if he can have one of those lemon cookies after his lunch! I love that you have a little cooking helper, Sarah! You are not only having fun but teaching him life-long lessons. Thanks for sharing your review, so happy you enjoyed these cookies as much as we do! This cookie is incredible. I didn’t have time to make several batches of “cookies” so I made them as sheet pan cookies with the raw sugar sprinkled on top — cooked for 22 minutes and cut into squares after they cooled. They turned out beautiful. What a great idea, Kellie! Thanks so much for sharing your results and technique, it sounds wonderful. 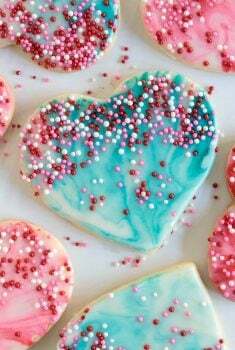 I will be baking these for ME! No one in my family eats coconut, but who cares. They look delicious. Where have I been not knowing about your move? I know! It have been babysitting my year old grandson. Heaven in a cookie! Could not have been easier to make. Great lemon and coconut flavor. I did not roll in sugar and thought they were plenty sweet without. Also, wasn’t sure about flattening on the tray before baking so some I flattened and some I did not – no need to flatten. Everyone loved them and I will be sharing this blog post so they have the recipe. A perfect addition to my cookie repertoire. Thank you for taking the time away from your move to post – I hope the final push to Asheville goes easy. I keep making these and they keep disappearing! An incredibly easy and delicious cookie. 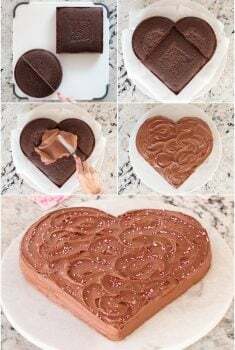 I hate to share the recipe because then my friends know how easy they are to make – but I do share, because perhaps they will make some for me! Perfect combination!! I really love coconut when it comes to sweets. Actually I love coconut in any way. Coconut water is very healthy. Ok no more coconut talk. Your cookies look amazing!! I bet they’re delicious. Lovely recipe. Haha! Thank so much Susana, hope you enjoy them! I just finished making these and they are delicately delicious! Thanks so much, Miriam! I have amended the recipe to include the lemon zest and juice! Thank you so much! My 81 yr old mom also bakes for the nuns at her church so this will make it easier for her too when I fwd the recipe. Really like your site and look fwd to finding more goodies within!! What a delicious combination Chris! And what a beautiful little kitchen assistant! Correction needed in Metric conversion: 1 cup shredded coconut = 100 g, not 237 g! Thanks, Janette! I have a recipe plugin that does the converting. It looks like they were off on this one! They look amazing, Chris! How wonderful that you had the lovely, young lady to help you. What a sweetheart! Our lives have been very hectic too with our house rehab going on this past month that I’ve only had time for the most important extracurricular activities…my family, grandchildren and golf with my husband during are far-too-short Midwest summer 🙂 Wishing you and Scott an easy closing and move ahead! I’m not seeing when you added the zest and the juice to the recipe. Thanks, Misti, I have added that to the recipe. When I heard coconut, I knew I’d love these! I love that you’re passing along your love of baking to your grandchildren. So far, my kids just have a love of eating 😉 Good luck with the transition!! These look Amazing! So great to see your name pop up in my inbox. Just a question about rolling the balls in sugar. I read about that step in your post but then didn’t see it in the recipe so just clarifying that you roll the whole ball in the demerara sugar before baking? And lastly do you flatten the balls pre baking or do they flatten themselves? Can’t wait to try them, my lemon tree just produced it’s first lemons ever! I bet you’re going to love the mountains – Asheville is a pretty phenomenal place and Ed and I often talk about living there. But who can leave the kids and grandkids behind? 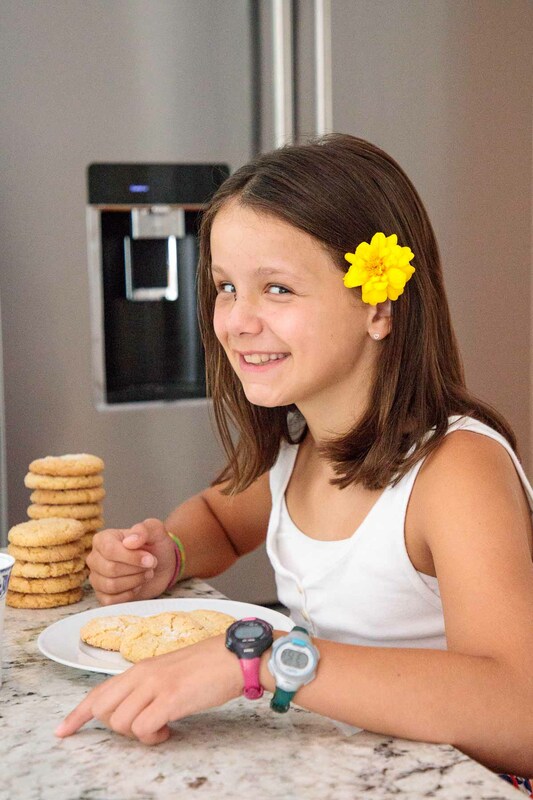 Anyway – love the cookies, the flavor, the texture and your beautiful granddaughter. Happy moving! I’m eager to try these cookies but am not sure when to roll them in the sugar. The sugar looks like a pleasingly crunchy addition. Thanks so much, Susan! I added the sugar step, thanks for noticing. I would have been a tad worried about you, but I knew you are moving. So is this to be closer to where your family has moved? I do hope you can get a really good internet connection!! Now I want cookies immediately! I’m so excited about your move Chris, and I can’t wait to see what you whip up in your new mountain kitchen! 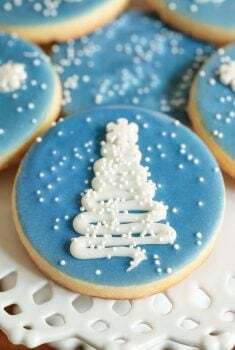 I’m amazed that you were able to make anything, much less these gorgeous cookies, with all that you’ve got going on ~ good luck! !